For Christmas a few years ago, Al got me a 23andMe genetic testing kit. I let it languish on the shelf until this past Christmas when I was back in San Francisco, when I finally got up the nerve to spit into a container and send it in to their lab. I had been avoiding it because I had convinced myself that the results would state clearly that I was a genetic ticking timebomb and then I’d never be able to unsee all the weird diseases I was no doubt carrying. (Some say that I have a bit of a tendency toward hypochondria, but let me go check WebMD). Several months later, I finally got the results of my genetic testing, which have been absolutely fascinating. 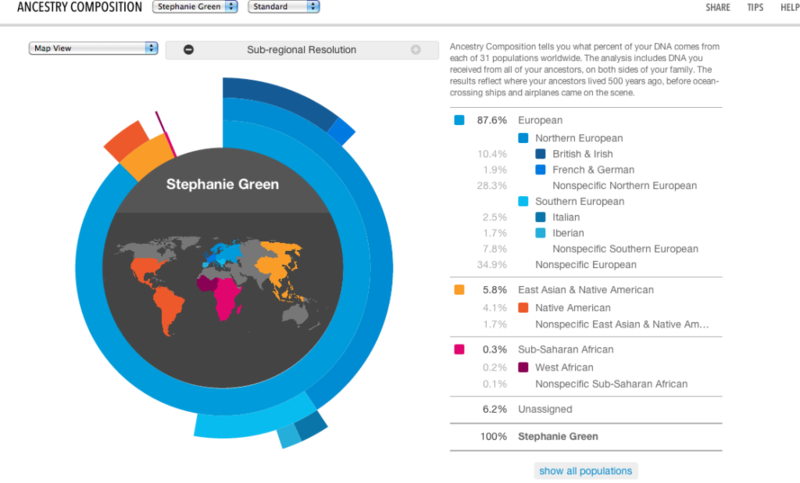 In case you’re not familiar, 23andMe is a company that does personal DNA mapping. For about $100, you can have all 23 of your chromosomes mapped and receive a wealth of information about your ancestry and your health (traits, risks, and so on). However, recently the FDA passed a totally BS ruling that prevents 23andMe from distributing health reports to its customers, so if you buy a kit now, you won’t receive detailed health reports, only ancestry information. The FDA decision didn’t apply to me since Al had gotten me the kit before the decision came down, so I got both detailed health reports and information about my ancestry. While the health stuff was interesting for me (and a big relief, since I’m not a carrier for any of the horrifying genetic disorders they test for, despite my fatalistic attitude), the ancestry information was much more surprising. Here are some of the most jaw-dropping things I’ve learned about my genes. 1. I’m 5.8% East Asian/Native American. Within that breakdown, 4.1% is Native American, and 1.7% is “nonspecific East Asian and Native American.” The Native American bit is actually Native Mexican, since my grandfather was Mexican-American. However, while I knew intellectually that Pop had Aztec blood, I didn’t realize how much; according to these numbers, a quarter of his genes must have been ethnically indigenous. Wow! 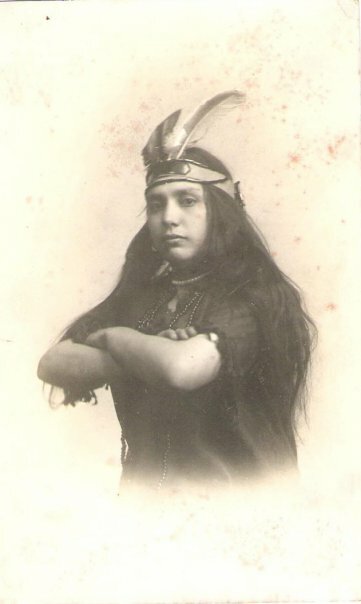 My great-aunt, Mary Rivero, 1915. This photo probably should have been my first clue that I had some Native American ancestry. It’s funny; I feel like every American wants to be part Native American (there was a great Happy Endings episode about this where Dave discovers he’s 1/16 Navajo and starts wearing a fringed jacket out of respect). But personally, I think it’s pretty badass to be part Aztec. My people were ripping still-beating hearts out of chests before it was cool. Also, they built huge temples and invented face knives, so, you know, that’s pretty sweet. 2. I’m .3% Sub-Saharan African, .2% of which is specifically West-African. This is a real head-scratcher. My dad, my husband, and I all came up with theories about where this Sub-Saharan ancestry is coming from, but we actually have NO idea, given what we know about my family history. To my knowledge, there weren’t a lot of Sub-Saharan Africans hanging around in Ireland, Mexico, or Italy, the places where my genes most recently hail from. For a second, we thought maybe it had to do with the Moors conquering Spain and then the Spanish going on to Mexico, but the genetic report is pretty clear that I have no North African or Middle Eastern ancestry, so that doesn’t make a lot of sense. Now, obviously, I want both of my parents to map their genes so we can see whether the African blood is coming from my dad or my mom’s side. Given my parents’ respective melanin content, I’m gonna take a wild stab and guess it’s coming from my mom’s side, but one never knows. 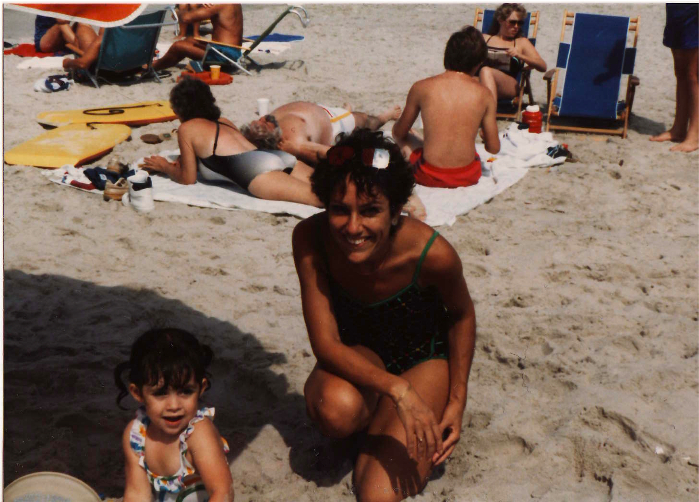 My mom IS super tan. 3. I’m 87.6% European, 40.7% of which is Northern European, 12.1% is Southern European, and 34.9% of which is “nonspecific European.” The European piece of my ancestry isn’t that surprising (especially considering that I have two European-born grandparents) but the more specific breakdown of the ancestry is kind of interesting, because even though my dad’s mom is from Abruzzo, Italy, only 2.5% of my genes are Italian. I guess this means that my Italian grandmother wasn’t purely ethnically Italian, which makes sense given Italy’s history and demographics. Guess I can stop taking credit for all of those Roman aqueducts now. 4. I’m 2.9% Neanderthal. And yes, that’s on the high end (80th percentile, to be exact). My husband is gleeful about the fact that I am, as he puts it, “2.9% beast,” but I find it a bit unsettling. According to 23andMe, “traces of [Neanderthal] DNA — between 1 percent and 4 percent — are found in all modern humans outside of Africa.” At least I’m not 4% Neanderthal. I told my husband that, given my ethnic background and now this Neanderthal business, I could have fared MUCH worse in the body hair department. And I have no noticeable brow ridge! So, this has all been very interesting for me. Have you done DNA testing or genetic mapping? Did you find out anything cool? This entry was posted in Life and tagged 23andMe, ancestry, DNA, ethnicity, family, Ireland, Italy, Mexico on February 10, 2014 by Stephanie. A. I loved Happy Endings and am so sad it was canceled. Happy Endings was the bomb. I still record the reruns on my DVR and watch them when I need a boost. I miss Penny and Max the most. The DNA stuff is really interesting. The West African genes for me are actually more recent than ancient humans, which is why it’s so interesting. For example, one of our friends did 23&Me and got 0.00% African, so the West African thing genes showing up for me are not coming from the fact that all humans started in Africa. If those genes were coming from one family member in my past, it would have been someone 9 generations ago, so fairly recent. I guess it could be coming from more than one family member, even further back, but that seems even more unlikely. So it’s just really fascinating and puzzling.